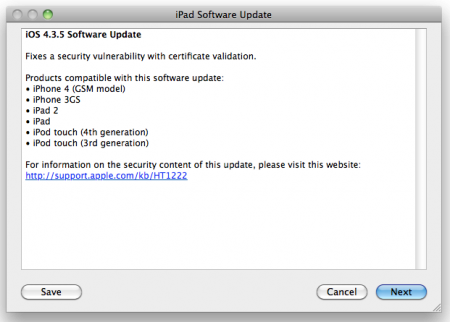 Apple has released iOS 4.3.5 security update for the iPhone, iPad and iPod touch. This update fixes a security vulnerability with certificate validation. If you already jailbroken your iOS device using JailbreakMe.com and want to keep the jailbreak then do not install this update. If youâ€™re not interested in jailbreak then make sure that you install this important security update. Apple has also released iOS 4.2.10 for Verizon iPhone 4 with CDMA technology with similar fixes.